I will start this with a disclaimer: I am not a professional therapist. However, I’ve been blessed to be witness to many professional therapists, pick their brains, and learn from them. Given my job at Grateful Bites / Ability 2 Work, I often find myself in conversation with many individuals from varying walks of life about working with the differently-abled. 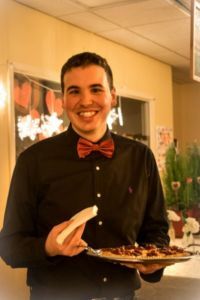 Many of my culinary friends want to know how it all works – teaching “disabled” young adults how to be a professional chef. Several special education teachers – or others who work at government run programs want to know about how we’re different – what we do that is working so well. And generally customers want to know about what we’re actually doing to contribute to our differently-abled apprentices lives. All can be answered with a simple analogy. Imagine yourself in a coma. But your brain is actually lucid, you’re able to hear everything that is going on around you but unable to move or speak. You’re lying there – stuck inside your own head, with no one to talk to but yourself. Everyone is milling about around you either ignoring you and talking to each other or talking to you in hopes you may respond. I’m pretty sure hollywood has made many horror movies on this topic! Your family, your friends, your doctors. All making decisions and talking about you as if you don’t even exist – you’re not even a person. You’re not lying there in front of them flesh, blood, and brain. BUT YOU’RE IN THERE AND YOU SO BADLY WANT TO TELL THEM WHAT YOU WANT! Your frustration clearly builds. Your desperation clearly builds. Your sadness clearly builds. Your feeling of inadequacy builds. And your deep rooted loneliness builds. After so much willpower and desperate motivation you can finally open your eyes. Your family is overjoyed – you’re in there and you’re awake. Blink once for yes and blink twice for no. Obviously not a clear channel of communication – they still can’t fully understand you. They have no idea what you want, how you feel. This exact feeling is what I can now see in so many of the differently-abled population. They’re not treated as living human beings. As if what makes them different makes them less than. They’re given menial jobs which have no substance or meaning to them. And while I’m appreciative there are people in the world trying to give them just a sliver of the chance – it’s like you’re still in a coma but you can open your eyes. You can kind of communicate and “do” things but you’re still not truly heard. I see the polar opposite with our apprentices. They learn the social and emotional skills to appropriately express their choices and what tasks are meaningful to them. Joyful learners are fantastic learners. If you follow our Facebook page you can see transformations before you eyes. Our support and culinary team of “neuro-typical” individuals truly listen and provide attention each apprentices needs. With us, they are never less than – always equal. And within all of us grasping that mind set – these individuals are able to flourish and become everything they were always capable of. Think about that for a minute: if the neuro-typical employees are trained, if we are aware they are equal to us in every regard and we help them find meaningful (to them) jobs, they transform. They pull completely out of their coma and are able to be walking and talking functioning members of society once again. Excuse my french but, they’re so damn happy. I even get a bit teary eyed just writing this, because I know with all of my heart that my fellow employees and I are able to create such environment to truly make a difference in their lives. We do it EVERY DAY. Just by treating them as equal – never less than. We make jokes and play friendly pranks. We have serious conversations about feelings, hopes and dreams. We even hang out outside of work as friends, as family. So back to my origin of this blog post. I am not a professional therapist – and my knowledge of the differently-abled didn’t extend very far before taking this job. However, I still wake up every day know that I’m making a difference. And I’m changing someone’s life in a positive way. That to me is all you ever need in life.